What do you think of King County Parks such as Cougar Mountain, Marymoor Park or the Sammamish River Trail? 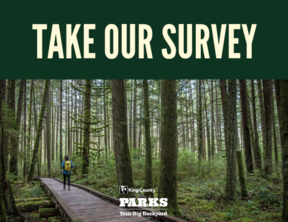 As part of our commitment to improving visitor experience, King County Parks is looking for visitor opinions – what’s great about King County’s parks, trails, and natural areas, and what could be improved to make them even better. The survey will be open until December 7, 2018. While #OptOutside started as a way to change behaviors on Black Friday, it’s bigger than one single day. It’s a choice you make every day. You’ve heard it before: being outside is good for you. Good for your health. Good for your attitude. Spend some time taking care of yourself . . . Read more. While your own yard might benefit from a simple raking, King County’s forests require a little bit more attention. Many of the 26,000 acres of forestland owned by King County Parks used to be timber plantations and weren’t managed to be forest habitat. To improve a forest’s resilience, King County forest managers are removing the bothersome trees, retaining mature broadleaf trees and snags, and planting conifers. Learn more. We are constantly updating our Instagram with sweet photos of our parks, trails, and open spaces. Tag @kingcountyparks in your photos for a chance to be featured on our feed. Follow us!